It is springtime in Texas. And, my thoughts are stirring along with the awakening landscape. 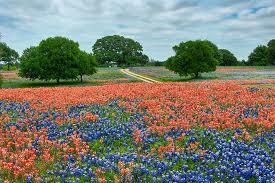 The bluebonnets and Indian paintbrush are in bloom along the highways and across pastureland. Red-bellied whistler ducks skim across our pond. 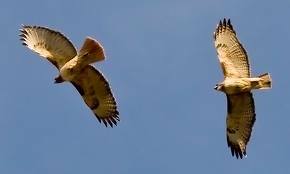 Hawks squeal and cavort in a strange and ritualistic mating dance across the sky. Wrens and mockingbirds and robins frantically feed their tiny young. Baby birds, it seems, are everywhere! 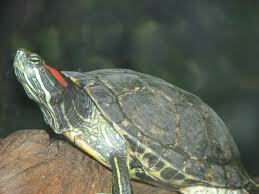 It is springtime in Texas, and I am thinking about turtles. 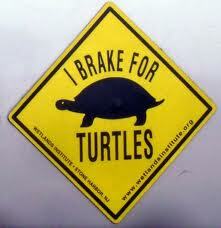 I’m thinking about turtles because at this time of year they are crossing the roadways. They are everywhere, and I do mean everywhere. You can’t drive down a country highway without encountering a red-eared slider or a soft shell or even a snapper that isn’t trying to cross to the other side. Where are they going? What is the rush? Is it mating season? 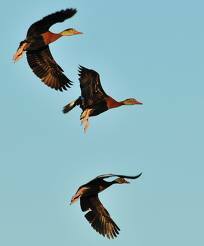 A mass migration? Is it just the fact that the grass is always greener on the other side? I don’t know. I just know they are trying to cross the road right in front of my car. And my car has an incredibly hard time slowing down for them. My granddaughter was telling me about a friend’s grandfather who likes to sit on the back porch of his country house and shoot turtles sunning on the side of his pond. Why? I asked her. Because he thinks it’s fun, she responded. He shoots them not because the family is hungry, and he is planning to prepare turtle soup; not because they are a menace to fish in the pond that could keep his family alive; not because they eat up the crops around his pond that sustain his and his family’s lives; not because they are a threat to the small children in his extended family. No, he shoots them because it is fun. Because he can. Okay, so here is how I see it. We have been endowed with custodianship over this world. I actually take that commission seriously. Without sounding like a tree-hugging, nut-eating wacko, I believe there are certain parameters under which we should operate. God gave us dominion over the animals and over the earth. I don’t take that as a master/slave relationship. Nor do I take that as a license to wipe out whatever species happens to be in the way of my manifest destiny to conquer and control every square inch of the planet. I take that mandate from God as a sacred responsibility. I don’t by any means believe that the Australopithecine whattle-throated, yellow-speckled, citrus-devouring caterpillar is more important than the energy or food demands of a modern world. We are to do what we can do to save the planet’s species but, come on, limits have to be drawn. We are responsible for ourselves, our children, our own personal welfare. But, are we not also supposed to be caretakers of this planet and of those creatures who cannot protect themselves against an ever-encroaching human presence? It may not seem like a big thing. It might only be infinitesimal. And yet, sometimes those small things make up the whole. Sometimes it is what is done in the details of the every day that make up a life. A life of sin. A life of glory. I know that in my own life, I often find myself hardening against the natural world. I find myself caring less and less about the fate of “inferior” species, whether they be fauna or flora. Hey, we’re in an economic crisis. We’re in a global cultural, political, and financial meltdown. I’ve got Me to worry about. My world–Population Me. Not a some variegated Lithuanian trout or a Peruvian tree frog or a Nebraskan orange-beaked hawk. It’s all about me right now. Yet, something nags and gnaws at the edges of my heart. A critter has burrowed into the crevices beneath the skin and slowly eats away at my ambivalence. Something forces me to remember that there is a world out there that I am a part of and that I have been given dominion over. I see a turtle crossing the road, and I have to force myself to remember to ask you, Lord, to help me to be the custodian you created me and all mankind to be. Help me to remember that my fate is tied to those creatures—great and small—who make up your world. Help me to remember that, while I am eternally important, everything around me is a part of your world, a part of your plan. We really can make a difference. Even if it’s only one turtle at a time. Susan, Susan, Susan…..how you can entertain with your words. I am never disappointed no matter what topic you choose. I think I will have to give you an award!!! Won’t be getting out of my car to help the next turtle I see but I will slow down and swerve to the best of my abiliity while thinking of you. Thank you, Clara. Sometimes, swerving in life is enough. This piece tugged at my heart. Your line “A critter has burrowed into the crevices beneath the skin and slowly eats away at my ambivalence,” is magnificent. You nailed that sentiment for nature lovers. Thankfully, we brake for all God’s creatures, large and small. Thank you, as always, Debra. I wish everyone braked for all God’s creatures. Thank you, Mona. Your eye for the natural world is beyond compare, and so your comments are much appreciated. I enjoyed this post so much. 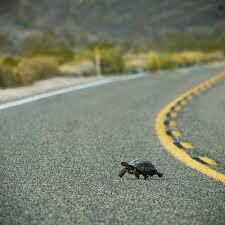 There are so many times when I feel like that turtle, plodding along with the world whizzing around me furiously. I’m always grateful when someone stops, takes a moment, and pauses for me. Thank you for your inspiration. I look forward to reading more of your writing. Thanks for the comments and for stopping by to read. “A critter has burrowed into the crevices beneath the skin and slowly eats away at my ambivalence.” – Mine too. Only mine keeps asking, “Why do you need more stuff when kids are starving and enslaved in the Sudan?” We are stewards. All life is important, else why did God in His wisdom place it here (maybe to show off His creativity?)? But something keeps burrowing through my busyness and whispers, “You can make a difference.” So here’s to turtles and the children who need us to stand for them…or just stop moving long enough to care. Thanks.